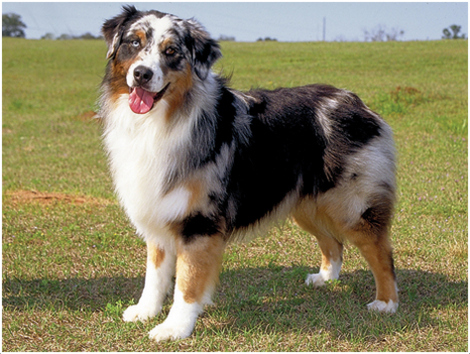 In spite of his name, the Australian Shepherd actually has its origins in the US, not Australia. They were basically useful for herding sheep and have been known to be extremely resilient to tough weather and terrain. 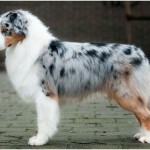 Australian Shepherd is a very intelligent and hard-working dog. He loves to work, whether it is herding sheep or acting as a watchdog or even doing household chores. 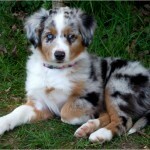 An Australian Shepherd has the ability and energy to play and work from sunrise till sunset without any rest. 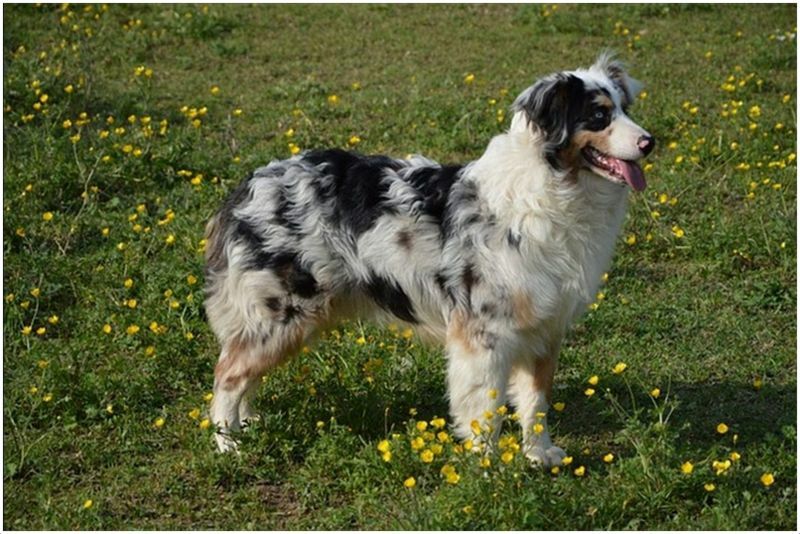 History – Australian Shepherd’s progenitors are believed to be from Basque region between Spain and France. They immigrated to USA in 1800s, especially during California gold rush. 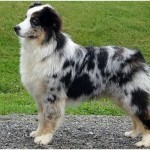 The breed as it looks like today was developed in south-west US. 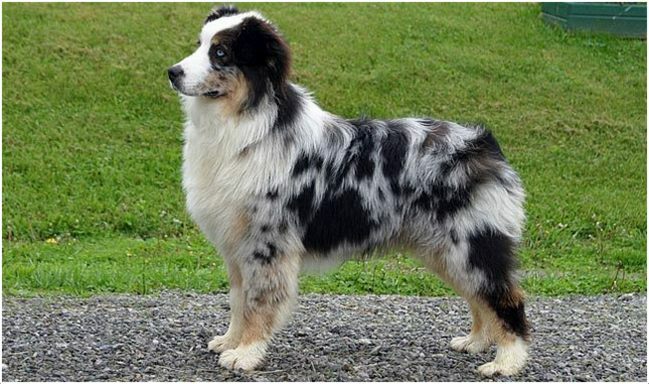 They were popular as sheep dogs in early 1900s and as rodeo and show dogs in 1950s. 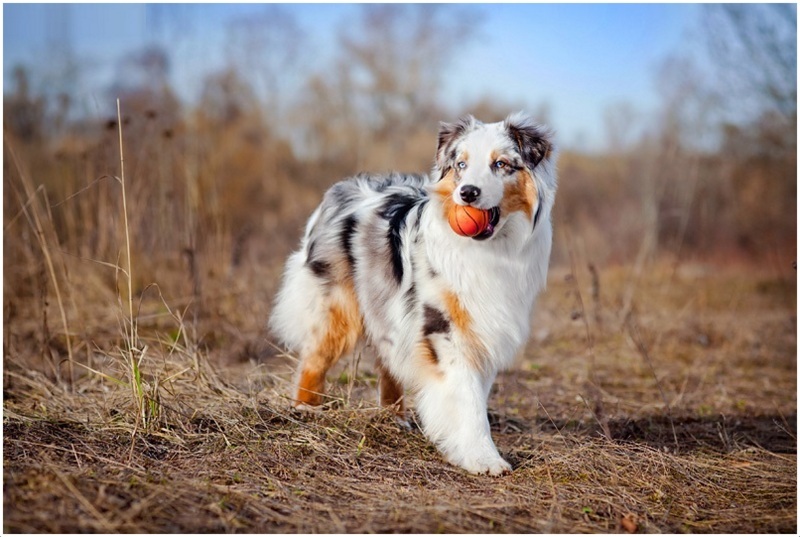 Health – Australian Shepherd is a generally healthy breed since they love being in the open air and exercise a lot on a daily basis. 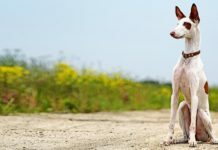 Some dogs may experience health problems like epilepsy and deafness which are caused due to abnormal genetic mutations. 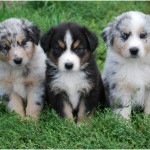 Older dogs may also develop vision problems due to cataract. 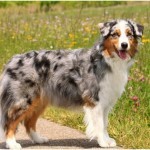 Personality – Aussies are very affectionate and easy-going dogs. They love to play and therefore prove to be excellent companion for kids. 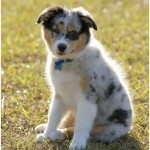 They also have a naturally protective nature which makes them very devoted and loyal friends for any child or adult. It is also a very brave dog and makes a very good watchdog. Activity Requirements – These dogs have a very high energy level and therefore need a lot of activity to burn off the energy. Long walks on a daily basis are an absolute essential. It also needs to run and bound around freely for a good amount of time. He is happiest when doing a job which requires constant movement like sheep herding. 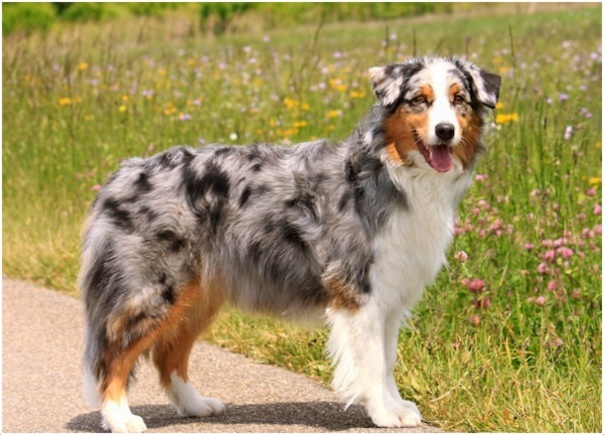 Trainability – One major personality trait of Australian Shepherd is that of obedience. 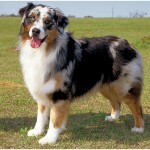 They are also intuitive and are said to have almost a kind of sixth sense for what their owner wants. These characteristics make them very easy to train. 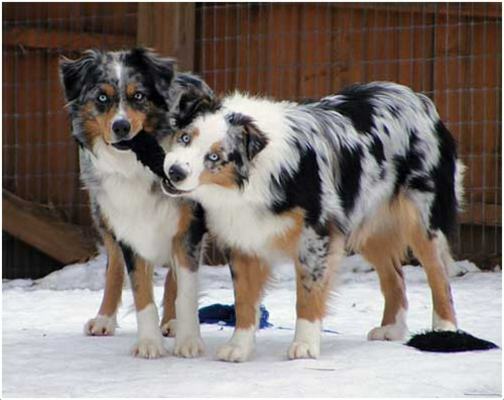 Behavioural Traits – Aussies are affectionate and playful dogs. They are also hard-working and they balance work and play quite efficiently. They are loyal to their owners and generally a little distrustful of strangers until they have had time to get to know them. 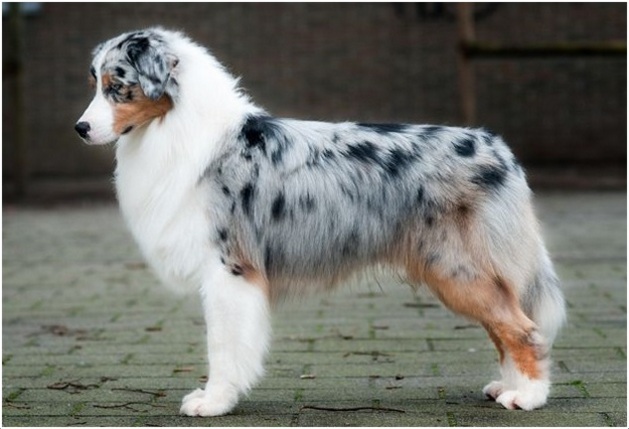 Appearance – Australian Sheepdogs are handsome looking dogs with a straight or slightly wavy coat. 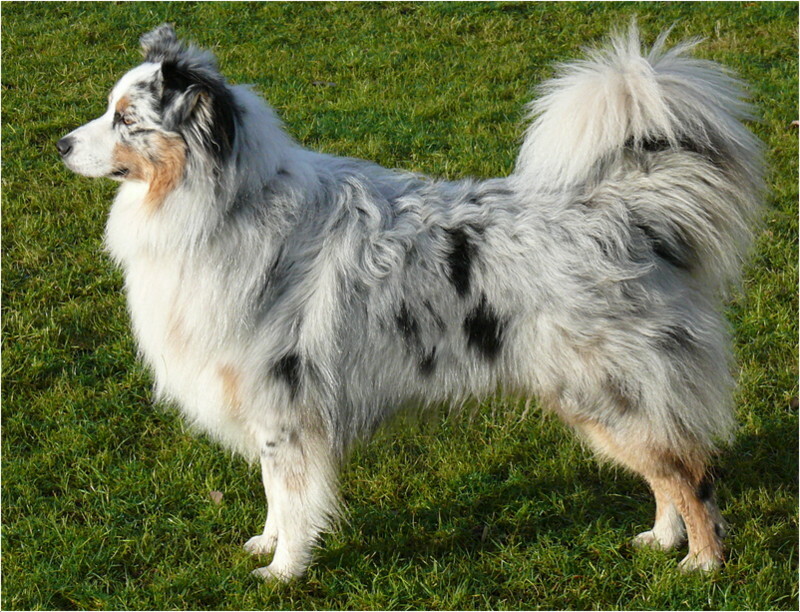 The hair on the head is short and smooth and all male dogs have a moderately frilly mane. They have a natural or docked bobtail and feathering behind the legs. 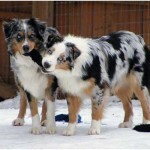 Size and Weight – Aussies are medium sized dogs. Male dogs weigh 25-32 kgs while females weigh 18-25 kgs. 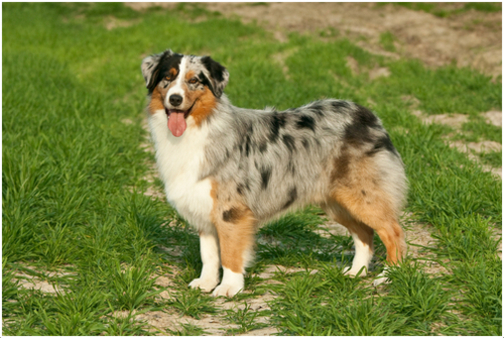 Coat and Colour – It has a straight or wavy coat which is highly weather resistant. It also has a very thick undercoat for the same purpose. 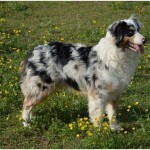 The colour of the coat can be black, blue, merle blue, red or merle red. 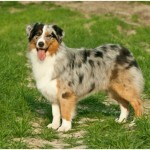 Grooming – It does not require a lot of grooming since the coat is smooth and straight. It only needs to be brushed occasionally especially during shedding. 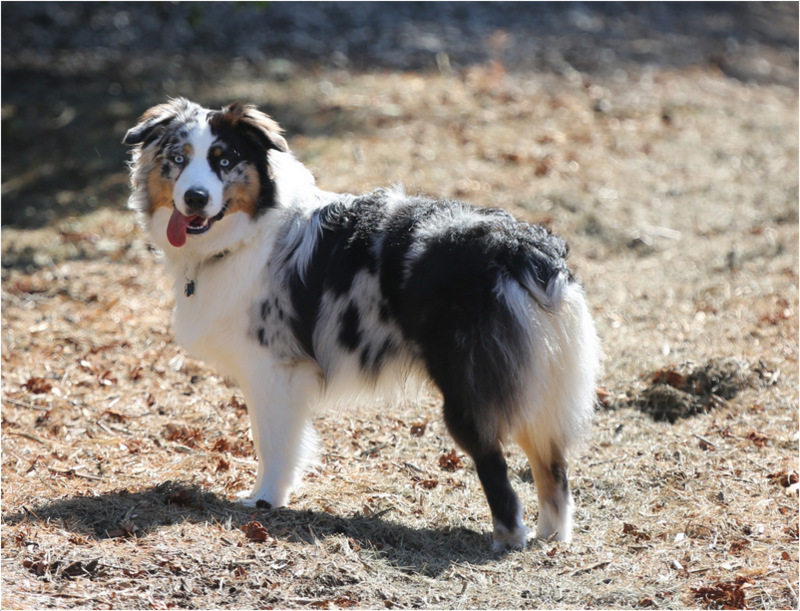 Body Type – Australian shepherd is a medium sized dog but inspite of being big in size and heavy in weight, it has well-balanced body and gives the appearance of a robust, healthy and rustic dog. It is very good with kids as he is playful and energetic. It is hard-working and loves to do any given job. It has a natural protective instinct. It can sometimes treat other house pets as a flock and try to herd them. It is great at dog sports like Frisbee catching. It makes a very good watchdog or police dog. It is a top contender in levels of obedience. It needs a lot of exercise daily. It can get easily bored since he hates not having a job to do. It is intelligent and can adapt to a situation easily and think on its own. Without proper exercise, they may get irritated and can bring the house down with continuous and loud barking. 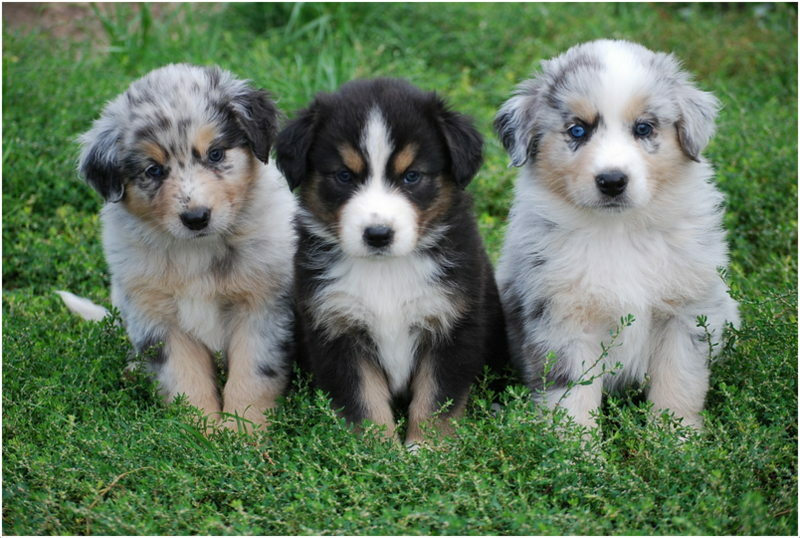 Australian Shepherds are wonderful pets for a family, albeit the family is an active one. They do not require special grooming or medical care but the one thing that is an absolute essential is lots of physical exercise. They need a huge field or at least a garden to run around in every day. 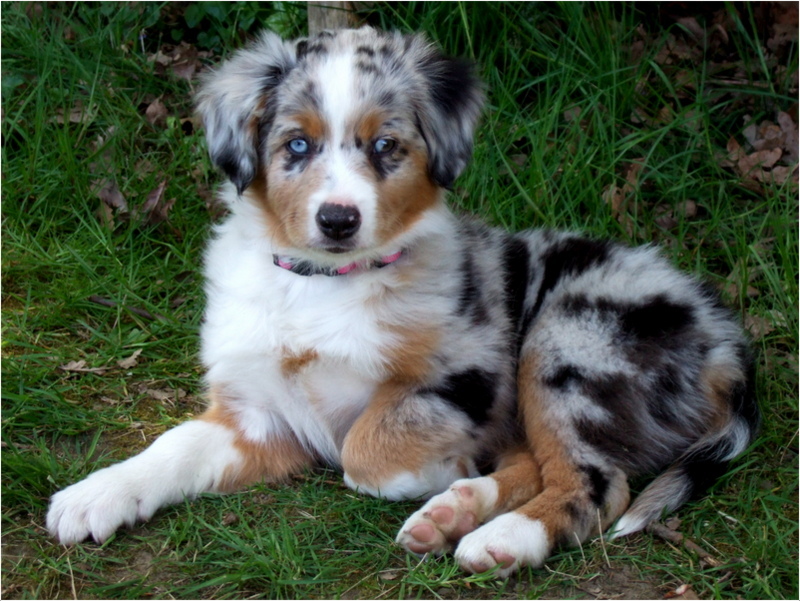 Recommended amount of food for Australian Shepherds is 1.5 – 2.5 cups of high-quality dry food. The actual amount of food will vary on a case to case basis depending on the activity level of the dog. The food should be divided into two meals a day. 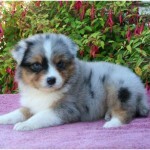 Full name of this dog is Australian Shepherd. 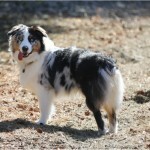 Other name is Aussie; was also known as Pastor Dog and New Mexican Sheepdog in early 1900s in south-east USA. Its origin is in the United States but theories also say that its progenitors come from the Basque region between Spain and France from where they immigrated to USA when it was discovered. It falls in the category of medium to large dogs based on size types. 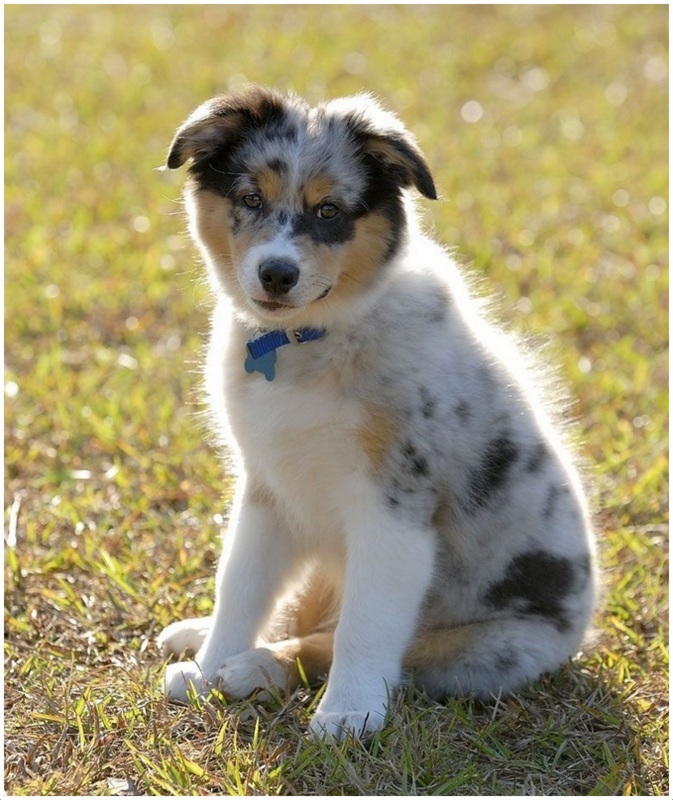 The dog is part of the Working Dogs/ Herding breed and is often used for sheep-herding. Average lifespan is 12 to 13 years. Ideal height is 51-58 cms for a male and 46-53 cms for a female dog. Weight can be anywhere between 18-32 kgs with female dogs weighing lesser than the males. This dog is black, blue or red. 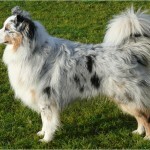 It can also have a blue or red merle colour i.e. the colour will darken as the dog grows older. 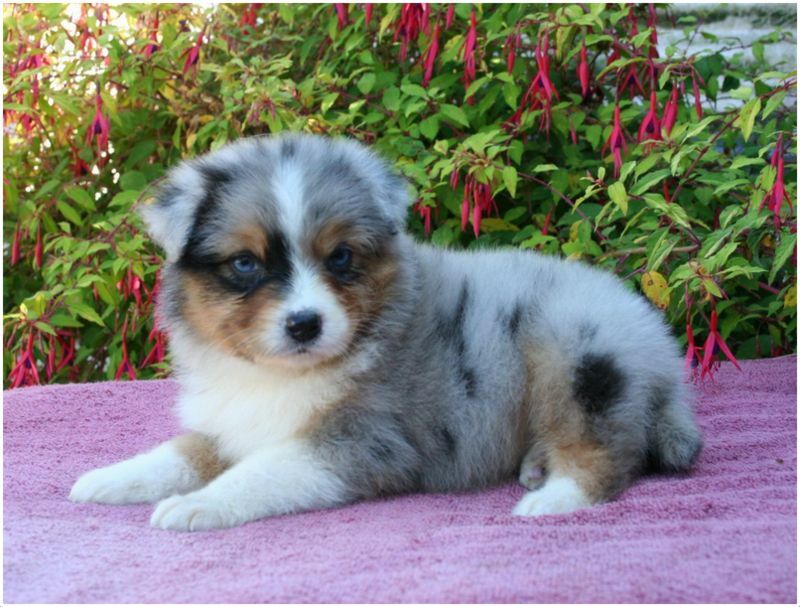 Price of one puppy of this breed varies from $500 to $1000. 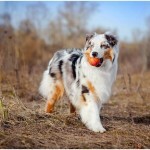 It is usually a very energetic dog and loves to work and exercise. He is an extremely loyal dog but is stand-offish towards strangers and needs time to socialize before acting friendly.